This article details how to install BrightWork on Microsoft SharePoint. Please review the checklist below before installing BrightWork. If you have any questions regarding any of the items on this list, please contact our support team before proceeding with the install or upgrade. Ideally carry out an upgrade or a new install on a test server first. BrightWork has the same system requirements as SharePoint. The correct and same version of SharePoint must be installed on all servers in your farm. See detailed hardware and software requirements for SharePoint 2013 for more information. Note: SharePoint 2013 RTM (v15.0.4420) is the minimum version of SharePoint 2013 required to install BrightWork. We also recommend installing the April 2013 CU (v15.0.4505) before installing BrightWork. Installing or upgrading BrightWork should be performed by an experienced SharePoint Administrator. You need administrative privileges on your SharePoint server to install BrightWork. While installing, you need full control access to the SQL Admin Content Database. We recommend you create a full backup of your SharePoint installation before starting the installation. Your setup meets the minimum System Requirements - these also need to be checked for upgrades. The correct and same version of SharePoint is installed on all servers in your farm. All SharePoint servers are fully configured and none have updates pending. You have administrative privileges on your SharePoint server (including all servers in a SharePoint Farm). You have full control access to the SQL Admin Content Database. We strongly recommend that you perform both installations and upgrades of BrightWork during a maintenance window, as the process will render SharePoint sites temporarily unavailable. The maximum number of worker processes is set at 1 per Application Pool (i.e. no web gardens). IP Affinity is enabled between Multiple Web Front End Servers (if multiple WFEs exist). Your web.config is configured as expected - an incorrectly configured web.config is the most common source of issues relating to installs or upgrades. Note: Installing BrightWork writes updates to your web.config to facilitate charting and other reporting features. Copy the BrightWork installer to your server desktop and double-click on it to begin the installation. Review the License Agreement, select I Accept and click Next. 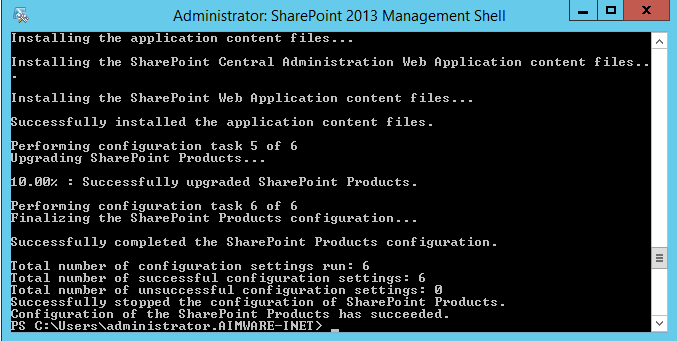 Right-click on the SharePoint 2013 Management Shell and select Run as administrator. cd "C:\Program Files (x86)\BrightWork\15\Install Files"
.\InstallSolution.ps1 "C:\Program Files (x86)\BrightWork\15\Install Files\BrightWork.wsp"
Close the SharePoint Management Shell when "Solution BrightWork.wsp is now installed" displays. Note: If you experience a long delay, seeing Deployment Status: Scheduled, it may relate to a known issue with timer jobs. See this Microsoft article, Administrative Timer Jobs not running after upgrade, for details. This article also applies to later versions of SharePoint. Close the SharePoint Management Shell. The SharePoint Products Configuration Wizard (psconfig) is a SharePoint Utility that needs to be run periodically for proper SharePoint maintenance, for instance, after a SharePoint Cumulative Update or to update the SharePoint databases with changes specified. It is needed in a new BrightWork install to update SharePoint after installing BrightWork. Please note that the psconfig utility can highlight issues with the configuration of your SharePoint Server Farm. Right-click on the SharePoint 2013 Management Shell and click Run as administrator. The below screen should display. Run iisreset and close the Command Prompt window once "Internet services successfully restarted" is displayed. If you are upgrading from BrightWork for SharePoint 2010 to BrightWork for SharePoint 2013, you will also need to deploy an additional solution. Note: This section only needs to be carried out if you are upgrading BrightWork 2010 and SharePoint via the Database Attach method. BrightWork 14 refers to the version of the Microsoft Office family of products that BrightWork was installed on. .\InstallSolution.ps1 "C:\Program Files (x86)\BrightWork\15\Install Files\BrightWork_14.wsp"
Close the SharePoint Management Shell when "Solution BrightWork_14.wsp is now installed" displays. BrightWork for SharePoint 2013 licensing requires a unique license per farm. You should already have your BrightWork license for your main farm. If you do not have your license, or require licenses for other farms in your organization, follow the steps in Obtain BrightWork License. Unzip the License file you received from BrightWork to a suitable location on your server. Login to SharePoint Central Admin and click General Application Settings. Click Browse and select the BrightWork license XML file. Note: The BrightWork license can take up to 10 minutes to propagate. To apply it immediately, you can run iisreset. BrightWork for SharePoint 2013 licensing requires a unique license per farm. You should already have your BrightWork license for your main farm. If you do not have your license, or require licenses for other farms in your organization, follow the steps below. To obtain your BrightWork license, you must supply BrightWork with your unique Farm ID and BrightWork will use this to generate a license for your farm. Copy the Farm ID and email it to support@brightwork.com. To use BrightWork on an SSL-enabled SharePoint server, you must add the Root Certificate from the SSL Authority to establish a Trust Relationship. Login to SharePoint Central Administration and click Security. Fill out the form and click OK.
Run the steps below on all other servers in the farm. BrightWork includes timer jobs that require feature activation to take advantage of the functionality they provide. The Project Metrics Recalculation Timer automatically recalculates all the active metrics. The BrightWork Project Cache Maintenance Timer Job validates and updates the Project Cache. The BrightWork Project Status Report Cache Maintenance Timer Job validates and updates the Project Status Report Cache. The BrightWork Scheduled Email Timer Job sends Scheduled Email Reports. The BrightWork Task Scheduling Timer Job recalculates task scheduling enabled lists. 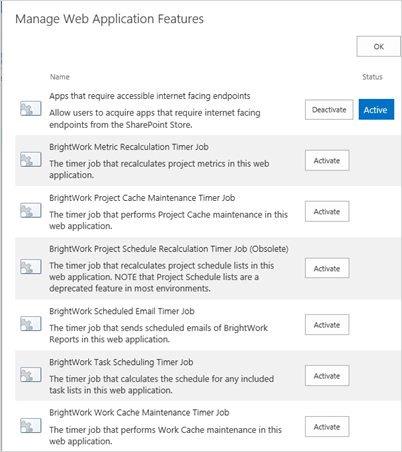 The BrightWork Work Cache Maintenance Timer Job validates and updates the Work Cache. Note: This task requires administrator access to the server and some knowledge of administering SharePoint. Login to SharePoint Central Administration. Ensure you have the correct web application selected and click Manage Features. Click Activate beside BrightWork Metric Recalculation Timer Job, the BrightWork Project Cache Maintenance Timer Job, the BrightWork Scheduled Email Timer Job, BrightWork Task Scheduling Timer Job and the BrightWork Work Cache Maintenance Timer Job. Note: The timer job features must be activated on a web application by web application basis. The Project Schedule Recalculation Timer Job supports a deprecated BrightWork feature – you do not have to activate this timer job. There are two ways to create a BrightWork Site Collection. The first way is to create a Training Zone site collection as part of the install process. When prompted for a URL for the new site collection, you can use the default URL provided by hitting Enter or you can create your own. You can use the default site collection title provided by hitting Enter, or you can create your own. Note: The Training Zone may take a number of minutes to create, due to the number of sites and templates being created. Login to the SharePoint Central Administration page. Ensure you have the correct Web Application. Give the site a Title and Description. Select BrightWork Site from the Template Selection box. Specify the Primary Site Collection Administrator. Note: The Primary or Secondary Site Collection Administrator of a BrightWork Site Collection must be a farm-level administrator (this applies even if no SharePoint farm exists). If you are using SharePoint Server, you may encounter a SiteFeedFeatureReceiver error when you try to create a BrightWork Site Collection. If so, you should deploy the User Profile Service Application with the service account added as an administrator. You do not have to deploy My Sites. Please see this blogpost for more information: SiteFeedFeatureReceiver Error. When you have completed installation of BrightWork, it is recommended to run through the Post-Install Checklist to make sure everything is working correctly.